The Corrections explores the lives of the Lamberts, a traditional and somewhat repressed Midwestern family whose children have fled to the East Coast to start new lives free from the influence of their parents. Chronologically, the novel shifts back and forth throughout the late 20th century, depicting in detail the personal growth and mistakes of each family member. Alfred Lambert is a railroad engineer and the stern patriarch of the Lambert family, based in an unnamed suburb of the fictional Midwestern city of St. Jude. After his children grow up and move to the East Coast, Alfred retires, but soon begins to suffer from Parkinson’s disease, causing his ordered, strict personality to fracture. Alfred’s loyal wife Enid has long suffered from his authoritarian behavior, and her life is made more difficult by Alfred’s worsening dementia. She is also concerned by their three children’s questionable life choices, as well as their abandonment of traditional Protestant values. Gary, the eldest Lambert son, is a financially successful but alcoholic banker in Philadelphia. His family suspects he is depressed, although he tries to deny it (mostly to himself). Chip, the middle child, is a Marxist academic whose disastrous affair with a student loses him a tenure-track university teaching position; with money troubles he accepts employment by a corrupt Lithuanian politiciandefrauding American investors. Denise, the youngest of the family, is a successful chef in Philadelphia but loses her job after separate secret affairs with her boss and his wife. As the economic boom of the late 1990s goes into full swing, the family’s problems become impossible to ignore. The separate plot-lines converge on Christmas morning back in St. Jude, when Enid and her children are forced to confront Alfred’s accelerating physical and mental decline. 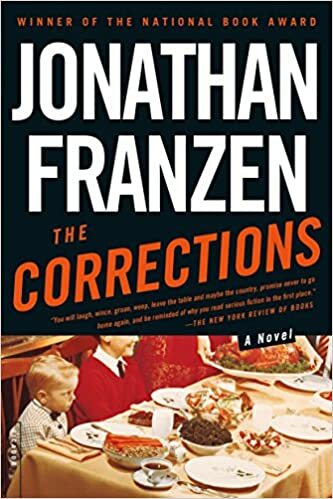 Also, reviews informed me that “The Corrections’” plot concerns a middle-class family of five in the late-twentieth-century Midwest, with Depression-era parents and grown kids who flew the coop. I happen to hail from a middle-class family of five in the late-twentieth-century Midwest, with Depression-era parents and grown kids who flew the coop. I thought the book might hit a little too close to home, and so I took a pass. Franzen is a spectacularly gifted writer. His insights and prose are endlessly inventive. He deftly mixes elements of Shakespearean tragedy with humor straight out of Kurt Vonnegut. He chooses the perfect word, the perfect phrase to illustrate his scenes. The major theme, in which members of The Greatest Generation and The Me Generation collide with societal change and with each other, is important to many Americans. National Book Award voters honored “The Corrections” in 2001, and justifiably so. This is a brilliant novel about the end of life of the parents and the intricate details of how this develops and ends around a final Christmas get-together. The writing is over the top in its investigation of the minutiae of the main players which includes a total of five, two parents and three children in adult mid-life. At the core is the father who is crumbling with Alzheimers and other old age limitations the novel delves into the psychological history of the grown children, two sons and a daughter. It’s sad, pathetic and linguistically overcooked; there are difficult scenes and wretched excess that disgusts the delicate reader; fact is the end of life with mental failure and loss of bodily control is not a pretty painting by any means and the Lutheran like Midwest darkness of the viewpoint is depressing and seemingly hopeless although by the collapse of the seniors of the family the great father figure has oozed into infancy and as often true the mother figure saddles up and keeps on riding into the future of the optimistic healing nature of long livers who just don’t take prisoners and keep on going to the final end whoever that turns out to survive. Writing style is truly psychologically intricate and worthy of remark but the overall mindscape is bleak and promises little hope unless you’re one of the “tough” pioneer survivors of American middle class moneyed life and its inevitable petty familial cruelties due to rapacious capitalist meanness. It was overwritten and probably needed to have a third cut, trimmed and honed toward a leaner less baroque verbal display more in the tradition of Nathaniel West’s cinematic leanness in Day of the Locust. Bergman would have enjoyed making a gray B&W film of this dreary novel. Beckett could have written a shorter, more humorously existential account with a little Irish tap room relief from the grinding deterioration of an American Humpty Dumpty clueless father figure. An iteresting novel that explores family dynamics: the coalitions, the squabbles and the lies we tell ourselves and each other.